Granite PAC dropped more than $175,000 on ads and other efforts to support Gov. Sununu in the final days of the campaign. Families First New Hampshire, one of several committees stumping for local Democrats, got its largest donation from new national group set up to fund Democratic campaigns across the country. Family Friendly PAC spent more than $200,000 to target Republicans who opposed family and medical leave legislation and support the Democrats running against them. But none of that advertising — or the money behind it — came from the candidates involved in those races. Instead, it came from so-called “independent expenditure” campaigns, groups financed by an often difficult-to-track network of donors who spend big to shape voters’ perceptions of candidates and issues. Independent expenditure groups occupy a nebulous place in New Hampshire’s politics. While plenty of partisan groups and individuals spend money to shape elections, independent expenditures are less tightly regulated than other kinds of campaign contributions. And they’re often used as a vehicle for super PACs and megadonors who might have already donated the maximum amount to an individual candidate but still want to exert more influence on a particular race. Independent expenditures are nothing new in New Hampshire politics; PACs tied to both national parties, union groups and other big players have long deployed them in gubernatorial races. But this year saw an unprecedented level of activity from outside spending to support Democrats running for the Legislature. The money these groups spend can prove particularly powerful in New Hampshire’s downballot races, where campaigns tend to be cheaper and a few dozen votes could make the difference in deciding which party controls a particular seat. According to a review of spending reports filed with the New Hampshire Secretary of State over the past two weeks, the biggest beneficiaries of independent spending in this year’s elections appear to be Republican Gov. Chris Sununu and Democrats running for the state Legislature. While the Democratic and Republican Governors’ Associations each spent millions on past gubernatorial races in New Hampshire, the groups remained largely on the sidelines for the bulk of this year’s campaign. But in the final weeks of the election season, the Republican Governors’ Association made a last-minute push to help keep Sununu in the corner office — dropping more than $844,000 on television ads, digital ads and media consulting. That’s more than twice what Sununu’s own campaign spent on television and digital ads during the general election, according to available campaign records. Granite PAC launched its Facebook page on Nov. 2, just four days before the election. The PAC spent about $121,000 on mail, $30,000 on phone calls and $23,000 on radio ads, all in the final two weeks of the campaign. 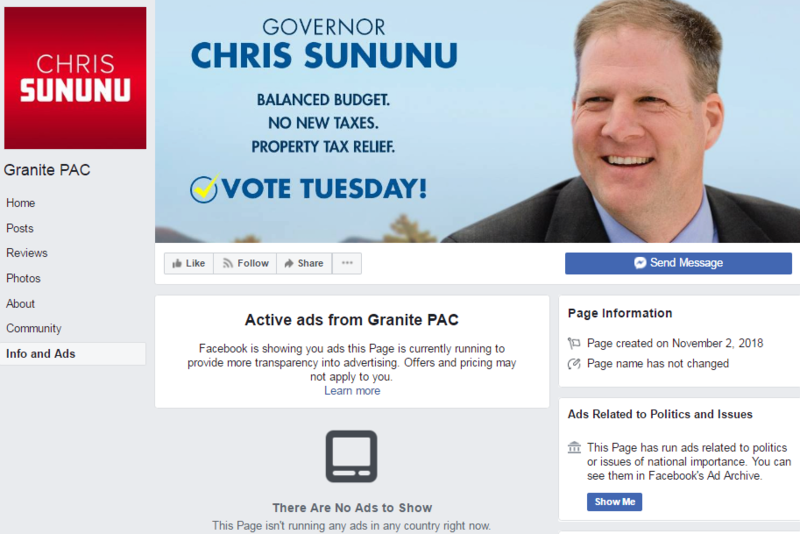 It also launched a Facebook page four days before the election, which then ran a series of digital ads on Sununu’s behalf. Other top donors to Granite PAC include Hooksett-based developer Mark Stebbins and Republican “megadonor” Walter Buckley Jr., both of whom also contributed directly to Sununu’s campaign. Hundreds of thousands of dollars of independent spending also poured into legislative races in the months leading up to last week’s elections — most of it to help Democrats seeking to turn the State House blue. The biggest player appears to have been the New Hampshire Leadership Committee, the local arm of the Democratic Legislative Campaign Committee (or DLCC). It spent just shy of half a million dollars on digital ads and direct mail supporting individual Democratic legislative candidates and targeting individual Republicans running for the Legislature. The New Hampshire Leadership Committee was part of a network of several other groups — funded by a mix of local and national megadonors, PACs and, at times, each other — spending big on downballot Democrats. One of the most active of those groups was Win Together Inc, which spent more than a quarter of a million dollars to help a slate of about 60 Democrats running for the Legislature. 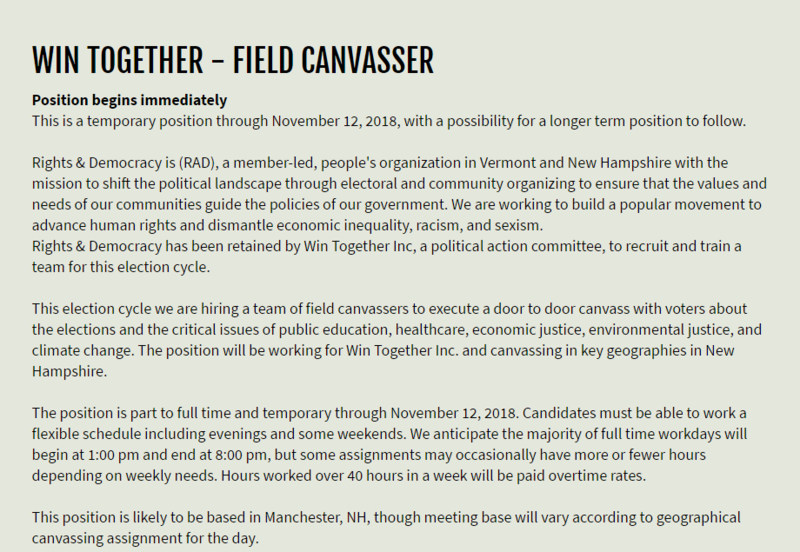 Rights and Democracy, a group that leads progressive campaigns in New Hampshire and Vermont, helped Win Together recruit canvassers for its campaign efforts in New Hampshire this fall. Most of Win Together’s money went toward paid canvassers. The PAC retained another local progressive group, Rights and Democracy, to recruit people to “execute a door to door canvass with voters about the elections and the critical issues of public education, healthcare, economic justice, environmental justice, and climate change,” according to a job posting on Rights and Democracy’s website. While Win Together’s approach was geared towards grassroots support, its money was decidedly less so. Most of the group’s funding came from a group called State Victory Action — a political nonprofit that’s poured millions of dollars into Democratic campaigns at the state and national level. State Victory Action is set up as a “527” group, which means it “can raise unlimited funds from individuals, corporations or labor unions, but they must register with the IRS and disclose their contributions and expenditures,” according to the Center for Responsive Politics. State Victory Action, in turn, got its initial funding from Democratic megadonors George Soros and Donald Sussman, as well as NextGen Climate Action Committee, a PAC funded by another Democratic megadonor and climate activist Tom Steyer. State Victory Action gave another $110,000 to a group called Families First New Hampshire, which also spent on Democrats’ behalf in local races. Where Win Together was focused largely on canvassers, people who go door-to-door promoting a politician or policy, Families First took a broader approach. It paid for phone banks against Sununu and in support of his Democratic challenger Molly Kelly. It also paid for canvassing material supporting Democratic legislators and opposing Republican ones. Some of its money also went toward Facebook ads urging voters in communities like Berlin, Wolfeboro and Center Harbor to “get to know” local Democrats running for the State House. In all, Families First New Hampshire spent more than $240,000 as of Oct. 31 — not counting additional expenses in the final days before the election. But Families First also funneled money back into other groups doing the same kind of work — including $70,000 to Win Together and $30,000 to yet another similarly named PAC. That group — Family Friendly PAC — is connected to the same consulting firm, Civix Strategy Group, that organized the campaign behind a family and medical leave bill in the Legislature last year. The group’s independent spending focused primarily on the state Senate, targeting Republican senators who voted against the bill and supporting the Democrats who were challenging them. Outside of its large donation from Families First, Family Friendly PAC got some its money from Stonyfield Farm Chairman Gary Hirshberg and an assortment of other local Democratic donors, but its largest donation came from Everytown for Gun Safety, backed by former New York City Mayor Michael Bloomberg. While these outside groups were all spending big to secure the State House for Democrats, there’s no such evidence of similar activity on the Republican side. The Committee to Elect House Republicans spent about $75,000 on independent expenditures supporting its slate of candidates. Another group, New Hampshire Priorities PAC, reported about $1,600 in advertising to support Republican Sen. Ruth Ward’s re-election campaign. But otherwise, there’s little trace of any full court press of independent spending for the Legislature mirroring what the Democrats had. The state’s campaign finance laws make it hard to pin down exactly how much spending outside groups are investing to sway public opinion on local races. The New Hampshire arm of Americans for Prosperity coordinated a campaign to call out Democratic gubernatorial nominee Molly Kelly’s support for business tax increases — complete with door hangers, digital ads and phone banking. But you won’t find any trace of how much the group spent on those, or any similar efforts, in the state’s campaign finance system. That’s because Americans for Prosperity is not registered as a political committee. The group maintains it’s engaging in “issue advocacy,” not political campaigning, and state attorneys have repeatedly ruled that the group is complying with applicable campaign finance rules.